Firefighters monitor a backfire while battling the Ranch Fire, part of the Mendocino Complex Fire near Lodoga, Calif., on Tuesday. 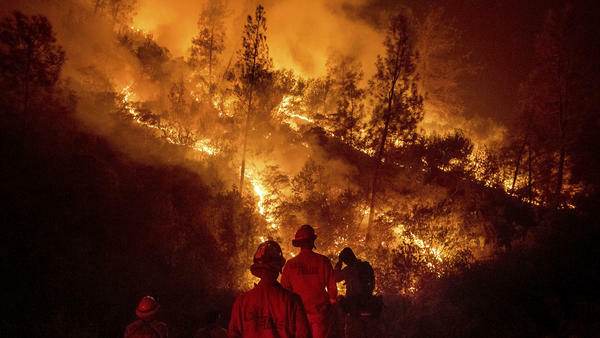 Firefighters in California are currently battling 17 major fires, including the Mendocino Complex Fire, which has spread over 292,000 acres, making it the largest in the state's history, according to Cal Fire. Officials say that fire won't be contained until at least September. California is experiencing longer, stronger and larger wildfires that scientists say are the result of climate change. Ross' directive came days after President Trump posted a tweet blaming the intensity of the fires on state environmental policies and incorrectly claiming water that could be used to fight the fires is being pumped into the Pacific Ocean. "California wildfires are being magnified & made so much worse by the bad environmental laws which aren't allowing massive amounts of readily available water to be properly utilized," Trump tweeted on Monday. "It is being diverted into the Pacific Ocean. Must also tree clear to stop fire from spreading!" But fire experts say there is enough water in California to fight the fires. In fact, water is just small component of what firefighters use to battle massive wildfires, says William Stewart, a forestry specialist at the University of California, Berkeley. "What really puts the fire out are basically people on the ground ... cutting all the vegetation down to bare dirt or the use of bulldozers to knock all the vegetation down, and ... the red retardant, which is actually a little bit more effective ... than water," he tells Here & Now's Jeremy Hobson. "So water is used sometimes, but it's only a small piece of the suppression game." Stewart says when Trump talks about diverting water into the ocean, he is conflating two different issues: how the state manages rivers and irrigation water, and how it fights fires. Some speculate Trump is trying to strengthen his administration's case for weakening the Endangered Species Act and fighting California's environmental laws, Stewart says. For decades, farmers and environmentalists in California have been entangled in a dispute over laws that limit the amount of water diverted from rivers and streams for irrigation. Environmentalists say diverting less water helps protect endangered species such as chinook salmon, while farmers say water limits are hurting the state's $50 billion agricultural industry. Last month, Interior Secretary Ryan Zinke visited reservoirs in the Central Valley, where California regulators are expected to implement a new plan for water usage. Zinke told reporters that there is a "federal interest as the water master." "That's been a long-standing, fairly complicated discussion dialogue we've been having in California for 30 years, but it really is a totally different issue than wildfire suppression up in the forest," Stewart says. In his tweet, Trump also suggested that thinning forests could dampen the strength of future wildfires, which some say could be used to justify his administration's plan to expand commercial logging. But fire experts say efforts to reduce kindling in the forest are a basic part of forest management and not a solution to the larger problem, says Matthew Hurteau, a forest ecologist at the University of New Mexico. "I mean, if we wanted to make a forest asbestos-proof, you could clear-cut them and pave it, right?" he told All Things Considered. "The basic fact of the matter is if we do that, we lose the forest, and we lose all of the ecosystem services that forests not only provide to us, but also in terms of having a functioning ecosystem in that place and habitat for wildlife, watershed protection and all that." While the reasons for massive, longer-burning wildfires are complex, there is consensus that wildfires will occur more frequently with climate change, according to the U.S. Geological Survey. So if people accept fires will happen, they can be more proactive about fighting them, Malcolm North, a research scientist with the U.S. Forest Service, told NPR's Nathan Rott. "If we make peace with that fact that we're inevitably going to get fire, I think at that point, we can have a ... hopefully an informed discussion about how we want that fire to occur because the current situation has made a choice already that we're going to try to put out all these fires," he says. "And we end up in a triage situation, which is just hemorrhaging money without ever getting out in front of the problem."